The word is officially out … so now we can share! Fresh off an eerie stint on The Killing, Bex Taylor-Klaus has been cast on Arrow Season 2. The young actress will portray the DC character of Sin on Episodes 3 and 4 this fall, an individual known to fans of the comic book as having connections with both The Black Canary (she’s actually her adopted daughter in the comic mythology) and Roy Harper. Sin first appeared in the comic Birds of Prey in 1999 and she becomes a martial arts master of sorts, which means Bex could have some training ahead of her. 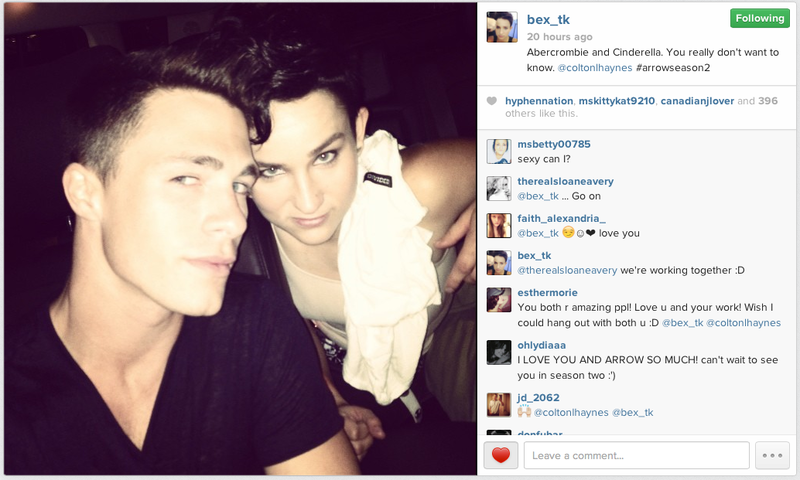 Bex posted a photo of her and Colton on her Instagram yesterday. 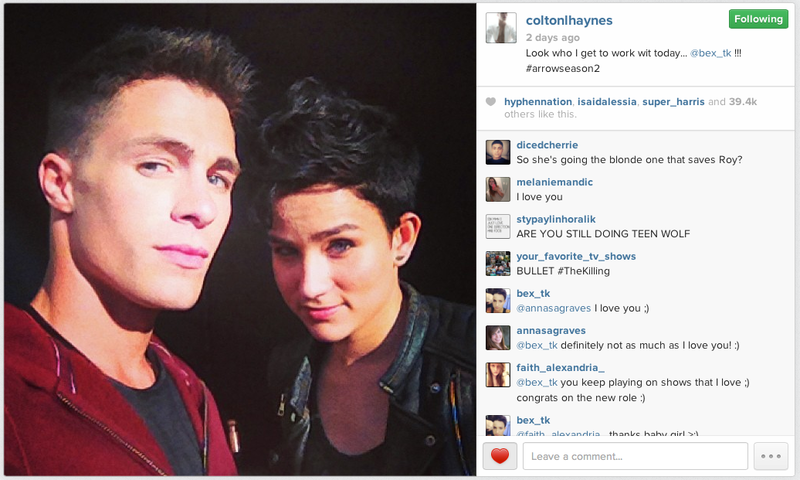 And Colton Instagrammed a photo of the two on set. If this is any indication of Sin’s look for the show, I approve. Arrow‘s second season premieres on October 2 on the CW. Bex Taylor-Klaus who plays Bullet on AMC’s The Killing, was snapped on the set of The CW’s Arrow, filming scenes with Roy Harper actor Colton Haynes. Will Willa Holland’s Thea have a romantic rival in Arrow season 2? Perhaps Oliver (Stephen Amell), won’t be the only lead male on the show having great luck with the ladies? Set photos of newcomer Bex Taylor-Klaus, who’s turning heads on AMC’s The Killing, imply that her character will be introduced onto Arrow through Roy Harper. Do these two know one another or have they just met? In the scene they filmed together, “Colton chases Bex across a used car dealership and she gets away from him”. If she’s meant to be a love rival for Thea, is she playing a punk-version of Cheshire? Then again, considering that was my first thought and the way Arrow’s showrunners like to play with fan expectations, she’s probably not Cheshire…probably. The actress is joining Arrow‘s second season playing the DC Comics character ofSin, TVLine has confirmed.Described as a wayward youth, Sin is befriended by the Black Canary and has a connection with fellow street urchin, Roy Harper. She’s set to appear in Season 2′s third and fourth episode. Bex Taylor-Klaus, best known as Bullet on the AMC drama, has joined in a recurring capacity. Arrow is adding another DC Comics character to its arsenal. Bex Taylor-Klaus, best known for her arc on The Killing as Bullet, has been cast as Sin, The Hollywood Reporter has learned. She will appear in the third and fourth episodes of The CW drama’s upcoming second season. 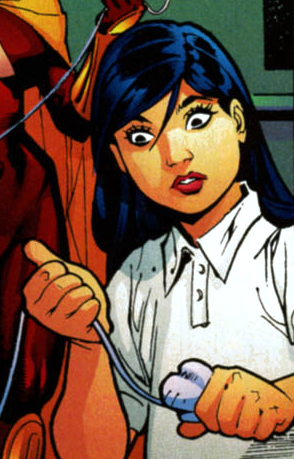 Sin, who first appeared in a 1999 issue of the Birds of Preyseries, is described as a wayward youth who is befriended by the Black Canary and has a connection with fellow street urchin, Roy Harper (Colton Haynes). At Comic-Con, producers revealed that a slew of new characters would be introduced: Brother Blood (Kevin Alejandro), Black Canary and Bronze Tiger (Michael Jai White). A sizzle reel featured a new actress playing Black Canary, a departure from the trajectory prescribed in the comic books for Katie Cassidy’s Laurel Lance — but executive producer Andrew Kreisberg indicated it was by design. During the Television Critics Association summer press tour, producers revealed that Barry Allen/Flash will appear in the eighth, ninth and 20th episodes. The 20th episode will serve as a backdoor pilot for a potential series. Taylor-Klaus is repped by Corsa Agency and Curtis Talent. Arrow returns Oct. 9 on The CW.